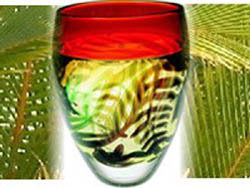 Experience This Special Interest Art Tour. This seven day art tour experience in tropical Australia was developed just for you! Now, in 2018, artists' situations have changed, but I have left this page up in its entirety to give you an idea of the variety of experiences that could be enjoyed by your small group, although those may not be exactly as described. A minimum of two months notice of your proposed visit will ensure the best experience for you. 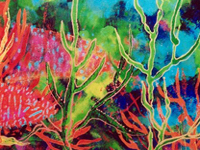 The exclusive Artquest Port Douglas art tour caters for small groups of artists, adult students and those interested in learning more about the art of Tropical Australia between June and October . Half or full day workshops in subjects of interest to you may be arranged. Do you have a group of art-interested friends? Perhaps you belong to an art society? If so, you may like to gather together six or more people for a week of varied and fascinating activities. It is also possible for individuals to join a group should places be available. 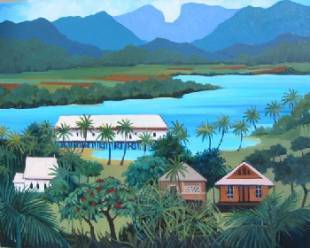 The art tour and workshop experience is informative and relaxed, taking you to beautiful places within easy reach of the small resort town of Port Douglas during the mild tropical winter. The opportunity to experience the lifestyle of the tropics from an artist's viewpoint, as you soak up the atmosphere of rainforest, mountain streams and even a tiny coral-fringed island, is very special. On most mornings you will visit artists’ private studios and chat with them as they demonstrate some aspect of their craft. This focus on artists and their working methods is an opportunity rarely available. 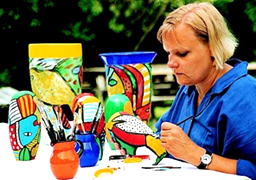 Learn oil painting techniques from leading tropical artists or attend art glass classes and come away with gorgeous jewellery or a glass paper weight. The choice is yours. Special morning or day-long art workshops may be arranged. Afternoons are more leisurely, when you may take advantage of the studio space provided to sketch some of your impressions, experiment with new techniques or create your haiku poems. You may prefer to use this free time to enjoy a swim, stroll through the town, enroll in a glass fusing lesson, play a game of tennis or golf...or to have a relaxing massage.Although your booking is a group one, activities are flexible and far from compulsory! 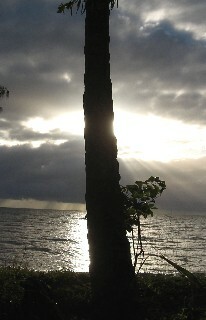 The leaders of your art tour in tropical Australia are locals who know the area well. They will be available to assist you and to answer your questions. For those needing some extra art tuition, help is at hand as one of your tour guides is a trained and experienced art teacher. Accommodation, for couples or singles, is in either a bed and breakfast home just a short rainforest stroll from famous Four Mile Beach or in a huge pole house overlooking the Coral Sea. Both properties have swimming pools and comfortable facilities. Your art tour guides and hosts are Lee Walters, Frieda van Aller, Colin Horton, Marie Simberg-Hoglund and Jill Booth. Their passion for the arts of the region and their commitment to quality service for their guests, ensure that you will enjoy an informative and inspirational experience. Variations in tropical conditions and artists’ availability means that the selection of six or more studios visited during your stay will be flexible. Some groups may wish, for example, to spend more than one day with a particular artist. 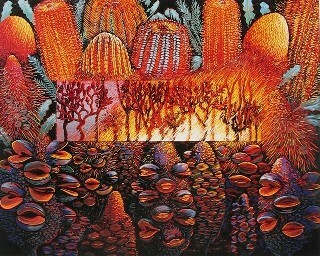 Typically, art workshops in tropical Australia may be held with a glassblower hidden in the rainforest, a potter, watercolourist, printmaker, shibori/indigo fabric artist, artists' paint manufacturer, silk painter, oil painter, photographer - you may even a enjoy learning traditional aboriginal basket weaving from a respected elder of her tribe. If you are a collector, in most cases artwork will be available for purchase direct from the artist. Some artists will accept commissions if you are looking for something really special. To set the scene for keen observation and to focus your mind on your creative endeavours an optional haiku poetry writing session is included early in your tropical Australian art experience. Art tour numbers are small (six – ten persons only). Your stay begins on a Saturday and ends on the following Saturday unless otherwise arranged. Shorter periods may be arranged as well as special half or full day workshops, according to your group's preference. We imagine that you would like to have some time to yourself, so free time is built into the seven days. You may wish to try out some of the excellent restaurants, go shopping, or just laze on the beach. Accommodation, all breakfasts and most lunches and dinners (such as a picnic in the rainforest, a barbeque on the beach and lunch at High Falls Farm are included in the price. Admission to studios, transport, tuition (if required), basic sketching materials, Quicksilver trip to Low Isles and wine tasting at a tropical fruit winery are also included. A very special conclusion of your tour is the award-winning Flames of the Forest dining experience, by a candle lit creek in the rainforest, wines and Aboriginal entertainment included. Extras are some meals, your travel costs to Port Douglas and personal items. It is highly recommended that you arrange health/travel insurance before you leave home. With your convenience in mind, in 2013 the seven day art experience may also be split into a four day stay and a three day stay for those whose time is limited. However, preference will be given to groups which book the seven day experience. This is recommended as being varied, comprehensive and excellent value. We have so much to show you and so many memorable experiences for you to enjoy! Our art tour and workshops in tropical Australia are the sort of experience that your hosts, themselves seasoned travellers, would enjoy. So we have tried to put ourselves in your shoes…we hope that the fit is perfect! Please see the Artists' Retreats page for details of the possibilities! Private and incentive/conference group charters are our speciality - just ask and we will be delighted to design an interesting, informative day or half day of surprising and memorable cultural activities. See this page for more about Cultural Tourism in action. Would you like to book a tour? Ask a question?